Jason Henderson's Beneath the Bridge is another beautiful novel I have read this year. When Elle Jensen’s mother is murdered, the only logical thing for the girl and her father to do is get as far away from Seattle as possible. In her new setting, Elle gets the attention of Jake Dickson and while they met for the first time under “The River,” the bridge, they make a strange discovery — the man covered in blood. Readers are introduced to powerful characters, young and dynamic characters, each with something about their past they would want to forget, but it is the mystery taking place under the bridge that will rock their worlds in ways they could never imagine. Beneath the Bridge is a gorgeous treat for fans of crime and mystery with a feel of horror. Jason Henderson is a great storyteller and the narrative flows gracefully. I enjoyed the way the author develops the themes of love, friendship, loss, and the mystery around the murder. Slowly, yet irresistibly, the reader is drawn into the story as the author unveils the different layers of his characters and the story. I enjoyed the “showing” as well as the “telling” aspects that were carefully balanced. The author pays a lot of attention to the world of the characters — young, excited about new beginnings, making friends and seeking answers. The book captures friendship that soon develops into sisterhood. The beautiful writing, the well-developed characters and the gripping plot, filled with suspense, are aspects of the story that readers will adore. I was utterly pulled into the story and kept reading till the end. Beneath the Bridge is a paranormal horror novel written by Jason Henderson. Halloween was only one month away, and Kayla was beginning to worry about just how long her parents would insist on keeping her grounded. Her crime this time hadn't been all that bad. She had borrowed her dad's car for a trip to the beach with Elle, Elle's boyfriend, Jimmy, and two of Jimmy's friends. There would have been no threat of danger to her with the three boys there, and she'd finally gotten Carl to ask her out on a date. Elle and her father's relocation from Washington State to California had been a godsend for Kayla. Her Aunt Kim, who was her only real friend, had moved across the country for a good paying job last year, in fact, just before Halloween. If Elle hadn't suddenly turned up at school six months later, Kayla would have been on her own. The two felt an instant rapport, as though they had grown up together or were sisters; they could speak freely and seemed of one mind on so many things. So, when Elle called, panic warring with terror in her voice as she spoke, and told Kayla she had to come over, Kayla braved the punishments she knew would be waiting if her disobedience was discovered, and she rushed to Elle's house. Jason Henderson’s dark urban fantasy novel, Beneath the Bridge, is set during that most remarkable time of year -- autumn -- in those magical weeks preceding Halloween, but the author doesn’t simply rely on that spooky and beloved holiday to create his ambiance. His characters are perched on the precipice between being children and adults, and their world expands as they begin to see romantic possibilities and new relationships while they hang out by the bridge in town. But there are other, darker entities out there, including, it seems, Elle’s old boyfriend who’s not at all happy with her rejection of him. I love coming of age stories, and having the opportunity to read one that’s set during the Halloween season, and that has otherworldly entities storming the portal between this world and theirs, is a rare treat indeed. 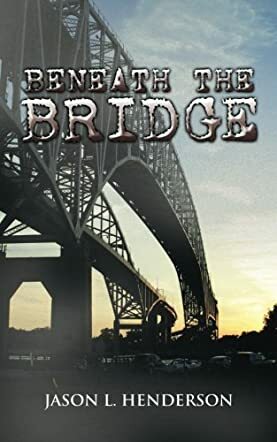 Beneath the Bridge is fast-paced and exciting, and the characters who people this dark urban fantasy are memorable and fun, especially Gary’s dad, who is proof incarnate that you’re never too old to be a geek, maintain an enthusiastic imagination and even have a few tricks hidden up your sleeve. I had a marvelous time reading Beneath the Bridge and most highly recommend it.